Among the many Metaverses there's Kaneva, which I visited today. Registration was quite easy and since there are no family names, like in Second Life, I was able to register myself as VeeJayBurns. After the registration it's time to download. 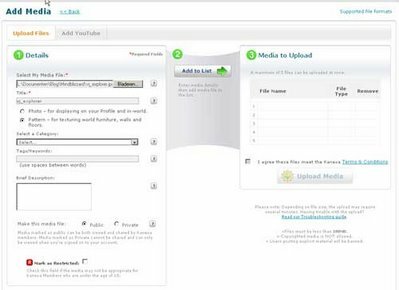 The first download, the install wizard is just 2Mb, but then the full engine is downloaded, 250 Mb, after installation about 500Mb. 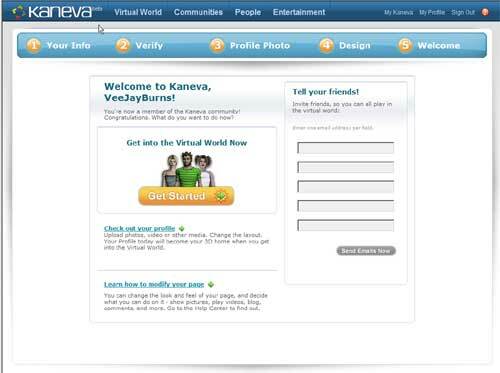 One of the great features of Kaneva is the personal homepage that you get as a resident - a good start to integrate Web 2.0 and Web 3D into one environment. Think of the power of integrating Second Life with Flickr, Blogger, YouTube, Twitter/pownce and Facebook all in one! 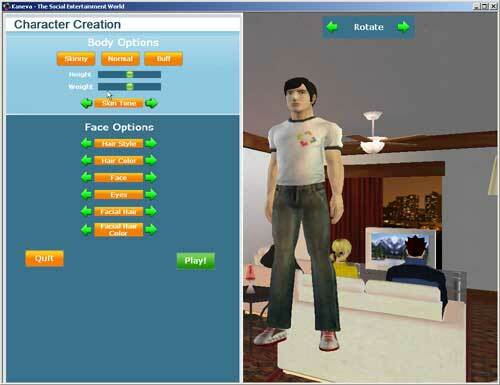 Character creation is very limited, compared to Second Life, same pretty much goes for content creation. Uploading textures, or patters works from webpages, which is actually a better interface than the inworld upload that Second Life offers. 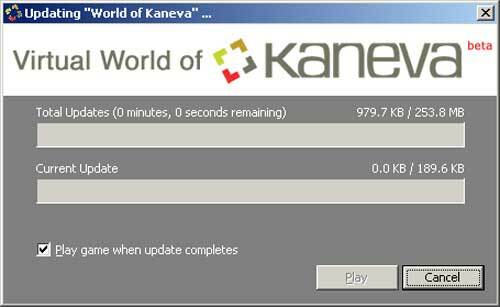 A thing that surprised - in a good way - was the speed of Kaneva. Movement was quite fast. 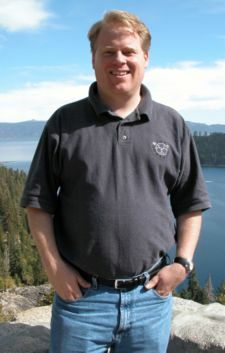 On the downside, as in SpaceStage I did not meet any people or found an easy way to wander around the world. 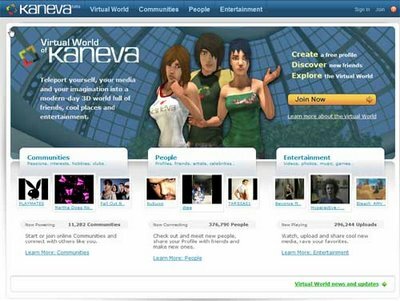 Kaneva does have some benefits to offer, some addons that may help to create a Metaversal identity, but is lacking in other parts compared to Second Life. 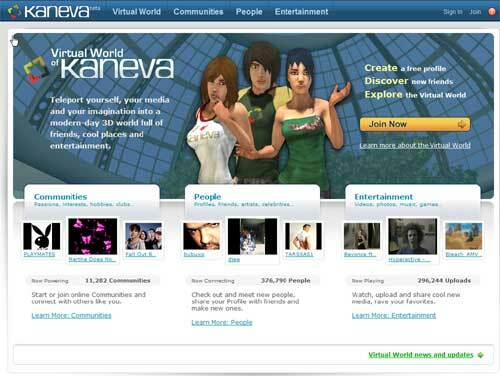 For instance, Second Life really has the upper hand when it comes to content creation and the openness of the world. Also the 'mandatory' orientation island exerecises may seem to be a bit overdone, but when entering a world for the first time - without any practise, does leave you at a loss sometimes. Here's a short review on Pownce, the new IM social networking thing from the States. We've had Twitter and Jaiku and suddenly there is Pownce. Pownce launched on june 26th into Alpha testing. So after barely one week of existence it is a little short to draw conclusions. 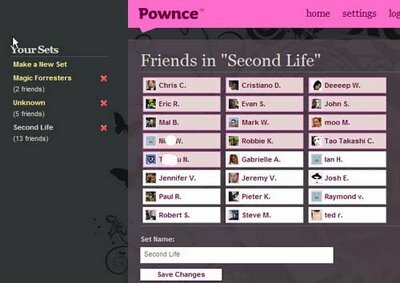 Too early to tell if Pownce will be the next killer app or will be doomed before it leaves alpha or beta testing. There are a number of features on Pownce which I really like. 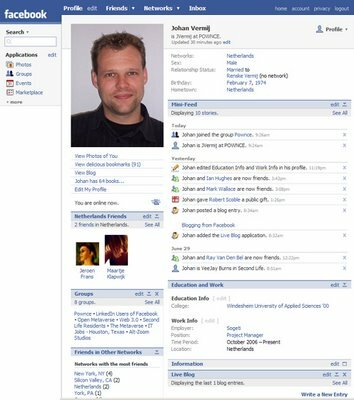 The screen below is the webinterface. 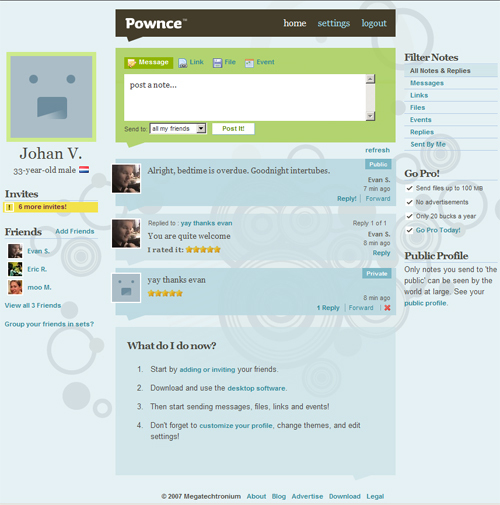 Pownce has a number of very nice features, when compared to Twitter or Jaiku. Off course, there's always a downside. The first two "weak points" may not be that bad at all though, depends on how you look at the world of Ol' Bill's Crap. My current templates works with alphachannels and transparency. 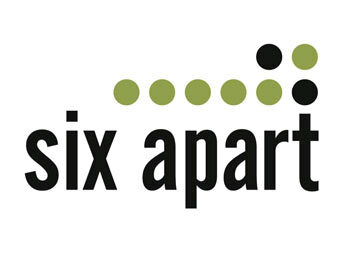 Doesn't work in IE6, so the background of white text becoms white, ergo non readable. After the sudden onrush of new twitter-seasoned folks it seems as if Pownce is experiencing some problems with scalability. 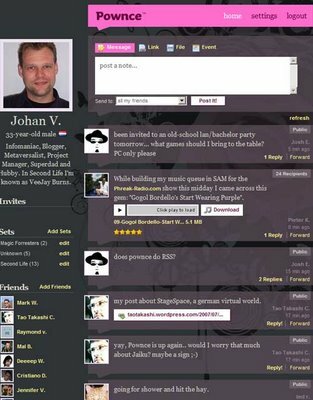 Finally there's some points that the lot of them (Pownce, Jaiku and Twitter) could take notice of: In this day and age of social networks and metaverses we all know eachother by different names, our real name, our social name, our metaverse name and what have you got. An extensive addressbook would come in handy. "What Pownce is missing is the mobile side of things. You cannot yet send or receive posts via SMS and additionally only one RSS feed is there right now which is the feed of your and your friend’s posts but not the one of the main timeline. Moreover an API seems to be there as they created an external application using AIR themselves and somebody made a Facebook application but it’s not open or documented it seems."